Sooner or later that plum position is going tobecome vacant at your workplace. You knowyou'll want it, but can you get it? Ask yourself:What's my track record? Am I smart enoughin the right areas? Do people like workingwith me? Do they respect me? 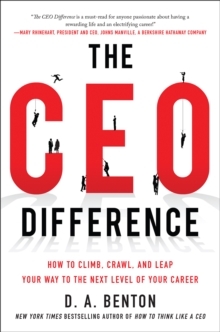 Would theyfollow me if I were in charge?Am I CEO material?Any aspiring ladder-climber should be able toanswer these questions-because, without adoubt, the competition thinks it can. 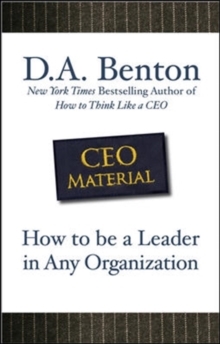 In CEO Material, D. A. Benton shows youhow to become highly visible and absolutelyindispensable to your organization. You'lllearn how to project confidence, even whensomething hasn't gone your way. You'll recognizethe value of being a generalist, able tocomprehend every facet of your business'sstructure and function. You'll find out how tokeep learning and growing so that you neverfeel stuck, much less appear so to decisionmakers. And most importantly, you'll masterfour C's that no true leader can be without:ConfidenceConstant CommunicationCraftsmanshipCoworker CollaborationInside, you'll find a lifetime of top-levelprofessional development advice that canmake the difference. 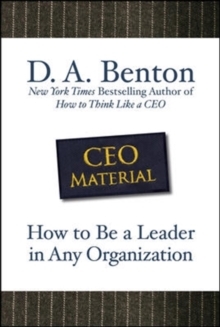 "CEO Whisperer" D. A. Benton is your guide to doing what mustbe done in order to make significant movesup the ladder. It's not just about showing up;it's about having integrity, taking charge,accepting challenges, and making an ally outof everyone you work with. 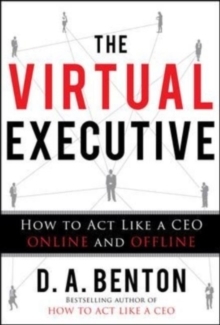 Conduct yourself like a CEO and you'll befirst in line for each new promotion in yourfield. 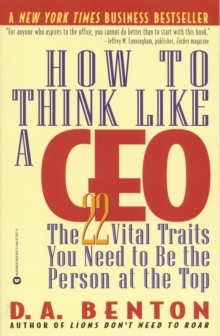 Transform yourself from an averageemployee to an indispensable corporateplayer with the help of CEO Material.